To decide upon the best form for any part of a vehicle, it is first necessary to become familiar with the actual work that part is expected to perform. Let us then, in the first place, inquire what the real work of the wheels in a common cart or wagon is. They are required first to support the weight of the cart and its contents. To fulfill the duty in the best manner, leaving out of consideration all other ques�tions for the moment, it is self-evident that the opening through the hub in which the axle rests should be horizon�tal. 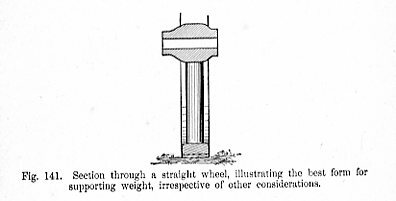 The spoke directly under the hub should be vertical, and a cross-section through the felloe and tire should show, that the latter is horizontal in its bearing upon the road. Fig. 141 illustrates the several requirements above enu-merated. Another requirement of wheels is that they rotate in the best possible position to allow of an even on-ward motion. To accomplish this all that I have just named is essential, with the addition that the axle arm be parallel. A third duty which wheels have to perform is to resist the horizontal strains due to uneven roads, and in some instances, as in light carriages, to turn corners at high speed. It is this last duty required of wheels that brings us face to face with the subject of dishing. Let us examine into the action of horizontal strains upon the spokes, the excellence of the tenons and mortises in the hub and felloes, and the strength added by the tire, to sup�port the weight. This wheel has nothing essentially bad in its design, nor has it anything good. While it does not actually violate any principle of construction, it does not take advantage of any by which its strength may be increased. It therefore occupies middle ground. It is neither the worst nor the best. It represents such a wheel as would be made without any consideration of scientific principles. Fig. 143 shows a wheel which is bad in design, and which is less advantageous for use than the one just described. The natural leverage of the parts is against stability and not in the direction of strength. The weight upon the outer rim, which is an equivalent of the horizontal strains upon a wheel in actual use, has a tendency to pull the felloes away from the spokes, and the spokes away from the hub. In Fig. 144, on the other hand, is shown a form which makes the best possible use of the mechanical principles involved, and which has such a shape that the heavier the weight on the rim, or, what is the same, the greater the horizontal strain, the more the felloes press against the spokes, and the more the spokes press against the hub. The hub is subjected to the strain it is best able to bear, namely, that of compression, while the tire performs its proper duty, that of binding all the parts together and resisting the outward thrust of the spokes. The strain which comes upon it is a tensile strain, which by its nature is the kind it is best adapted to. In Fig. 143 the action of the weight diminishes the strain against the tire. Like folding an umbrella the depression of the spokes makes the diameter of the wheel less, producing in the tire a ten-dency to slip off. The reverse of this is the case in Fig. 144, in which the greater the weight, or what is the same, the greater the horizontal strain, the greater will be the press�ure against the tire, and the more firmly will it be held in place. In practice, wagons are employed upon both smooth and rough roads, and upon level ways and side hills. Figs. 145 and 146 (page 144*) illustrate the position of a wagon or cart upon level roads and upon those which incline latterly. If now it can be shown that the strains coming upon a wheel in actual use are the same in character as are illustrated by the weight on the rims of the wheels in Figs. 142, 143, and 144, I have presented quite enough to prove the advantage of dishing wheels, if not to show the practical necessity of so designing them.